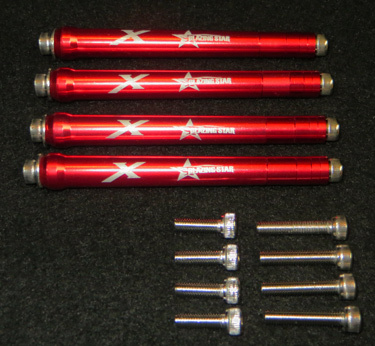 Blazing Star Standard Extra Long Standoffs are the same diameter as our standard set with added length. They are intended for our new 74" Slick 580 when using the Xpwr 30cc motor as well as previous 3DHS 74" AND 75" planes that use the Xpwr 30 or Motrolfly 4330. They provide a minimum standoff length of 73.84 mm (2.90") and a maximum length of 94.87 mm (3.73"). Please note: the holes in the radial mount for the Xpwr 30cc will need to be enlarged to 5mm. The Blazing Star Standoff Sets are designed specifically to work with our Xpwr Giant Scale motor line. They provide a simple and secure way to mount the 35cc-60cc Xpwr motors to a variety of airframes.